Now your pet dog can boldly go! Featuring a plastic clip for leash attachment, a rubberized molded zipper-pull with the phrase "To Boldly Go," a pad-printed Star Trek logo on the back, and raised plastic buttons, this 4 1/2-inch long communicator-ish dog bag dispenser is small enough to be convenient yet large enough to hold a goodly number of bags. 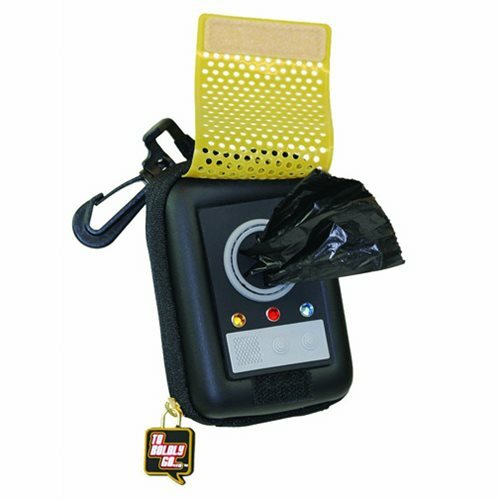 Order the Star Trek The Original Series Communicator Dog Bag Dispenser, because if you're going to pick up your canine friend's "donations," you might as well do so fashionably!